Runaway boats are a potential hazard that can be mitigated with a switch or other system that when activated in an emergency, provides the means to stop the propulsion engine. Emergency engine/propulsion cut-off devices, sometimes referred to as an engine cut-off switch or kill switch, are a time-proven safety device used to stop the boats engines should the driver unexpectedly fall overboard. A mechanical lanyard is designed to attach between a passenger/operator and the system that stops the engine under emergency conditions. The boat operator/passenger can unexpectedly fall overboard when the boat hits a wave, wake, takes a sharp turn, runs into a submerged object, suffers steering failure, and more. Many unmanned powerboats will enter and continue to turn in a circle until they run out of gas or hit something. That something could be the person that fell overboard. 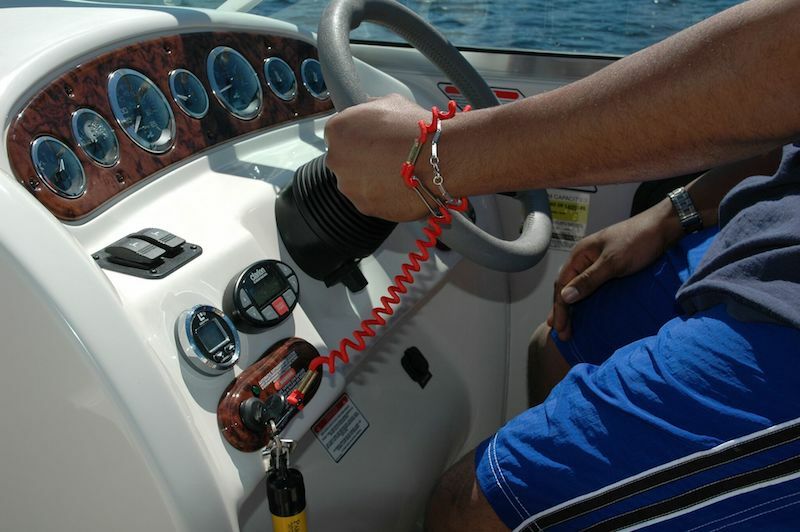 If the boat operator unexpectedly falls overboard and is not wearing an engine cut-off switch lanyard they will have placed themselves and any passengers that may have also fallen overboard at risk of being hit by the boat or the propeller. The U.S. Coast Guard strongly recommends that boaters always use the installed cut-off device when operating the boat. And if the boat doesn’t have one it is recommended that it is installed. Don’t launch without it! Considered to be an essential safety item. Boating accident statistics show that having the operator use the emergency engine/propulsion cut-off device would likely prevent many propeller injuries. Many manufacturers voluntary comply with recommended industry practice to install an emergency engine/propulsion cut-off device.